You are not logged in. 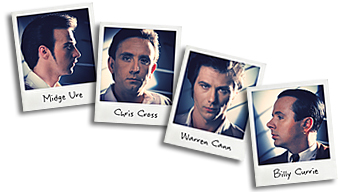 [Log In] Ultravox.org.uk » Forums » Socialising » Introduce yourself... » Hello from a new member! #90572 - Thu, 29 Apr 2010 01:53:00 Hello from a new member! I’m 45 years old and living in the middle of Sweden. First time I’ve listened to Ultravox was in 1981 when I heard Vienna for the first time, since then I’m a fan to Ultravox! Now I’m looking forward to see Ultravox live in Oslo at Friday, can’t wait!!! #90573 - Thu, 29 Apr 2010 02:21:00 Re: Hello from a new member! Have a great time on Friday. #90574 - Thu, 29 Apr 2010 02:26:00 Re: Hello from a new member! I'm sure you will enjoy Ultravox in Oslo, they were great in Copenhagen! #90575 - Thu, 29 Apr 2010 02:33:00 Re: Hello from a new member! #90576 - Thu, 29 Apr 2010 05:14:00 Re: Hello from a new member! #90577 - Fri, 30 Apr 2010 03:01:00 Re: Hello from a new member! Hi Mats. Hope you enjoy the gig. I'm sure you will. Welcome. #90578 - Sun, 02 May 2010 02:43:00 Re: Hello from a new member! 29 years waiting (long time!, but it was worth it) is over. The show in Oslo was great and wonderful. #90579 - Sun, 02 May 2010 03:02:00 Re: Hello from a new member! Hello and welcome to the madhouse !!! #90580 - Sun, 02 May 2010 18:08:00 Re: Hello from a new member! hello .welcome to the family of ultravox. #90581 - Mon, 03 May 2010 01:03:00 Re: Hello from a new member! #90582 - Mon, 03 May 2010 02:19:00 Re: Hello from a new member! Yes, I really hope for a new tour too. #90583 - Tue, 04 May 2010 17:36:00 Re: Hello from a new member! #90584 - Tue, 04 May 2010 20:11:00 Re: Hello from a new member! #90585 - Tue, 04 May 2010 21:39:00 Re: Hello from a new member! Hi Mats.... welcome to the madhouse! #90586 - Wed, 05 May 2010 19:31:00 Re: Hello from a new member! #90587 - Sat, 22 May 2010 05:37:00 Re: Hello from a new member! #90588 - Sat, 22 May 2010 20:38:00 Re: Hello from a new member! #90589 - Sat, 22 May 2010 22:06:00 Re: Hello from a new member! #90590 - Sun, 23 May 2010 01:06:00 Re: Hello from a new member! #90591 - Wed, 26 May 2010 07:57:00 Re: Hello from a new member! #90592 - Fri, 06 Aug 2010 06:41:00 Re: Hello from a new member! #90593 - Sat, 07 Aug 2010 05:44:00 Re: Hello from a new member! Hi and welcome, westham pete! #90594 - Sat, 07 Aug 2010 23:36:00 Re: Hello from a new member! hey Mat! this is stephen gardner from london .welcome to the forum. hope to have a warm discussion ahead.